This column was written by Richard Just. 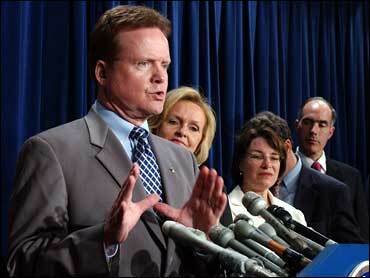 I am amazed at how many Democrats have fallen for Jim Webb. Suddenly, everywhere you look, people are touting Webb as the perfect running mate for Barack Obama. In recent days, as Webb has seemed ubiquitous (hawking his book, bantering with Jon Stewart, grinning at Obama's side), a disturbing number of my otherwise sane friends, family, and colleagues have told me that they view Webb as a perfectly acceptable choice -- or, more disturbingly, a good one. Earlier this week, Timothy Noah made the case against Webb in Slate. But he made it almost entirely on strategic grounds, arguing that Webb was a loose cannon and would therefore damage Obama's chances of winning. Maybe. But I think it's entirely possible that Webb would be a political asset to Obama. He could help deliver Virginia, and his political trajectory -- military man turned Reagan official turned moderate Democrat -- seems likely to appeal to centrist voters. To explain just what it is about Webb that bothers me, I need to distinguish between philosophy and policy. It's hard to know what any candidate will do on any particular issue once in office. This is not to say that the stands a candidate takes on specific policy questions are meaningless. But the political world is unpredictable -- alliances shift, circumstances change, things turn out to be more complicated than expected. This is why the best voters can hope for is a candidate whose underlying instincts about the world we basically trust. At this point, I am confident that Obama's underlying worldview is that of a liberal. Of course, there is plenty of room for disagreement about what it means to be a liberal -- on foreign policy, on economics, on social issues. But, whatever your views on humanitarian intervention or health care mandates or gay marriage, if you call yourself a liberal then chances are that you recognize clear similarities between Obama's basic instincts about the world and your own. Everything we know about Obama -- about his life, about his policy positions -- suggests that liberal values undergird his outlook. And so, even though I don't agree with every single policy stand Obama has taken during the campaign, I generally trust him to make good decisions as president. That is why I voted for him in the primary and why I am voting for him in the general election. For a liberal, violence may sometimes be a necessary thing. It may even lead to good outcomes. But while those outcomes may be worth celebrating -- and while the people who do the fighting may be correctly labeled courageous or even heroic -- the violence itself is never worth celebrating. Webb's outlook flies in the face of this liberal ideal. He seems to be very much in love with violence. It turns out Webb is also something of an apologist for the Confederacy. He has accused "revisionist politicians and academics" of trying "to defame the entire Confederate Army in a move that can only be termed the Nazification of the Confederacy." When I saw the Politico piece that came out on Wednesday documenting Webb's views on the Confederacy, I can't say I was shocked. That's because, years ago, when I was working at The American Prospect, I spent some time reporting on a Sons of Confederate Veterans chapter in southern Virginia; and there are clear similarities between the Sons of Confederate Veterans' worldview and Webb's. For one thing, they share an unhealthy obsession with the past. I remember watching in disbelief as one member of the group I was interviewing became choked up while recounting to me what happened at the Battle of New Market in 1864 -- to the point where he couldn't finish the story. I have no idea whether Webb would grow teary talking about Civil War battles, but his enthusiasm for the history of his own people is considerable, to say the least. And while I have no problem with people being interested in their heritage -- most of us are -- I find Confederacy apologists' specific obsession with continuing to litigate the historical case of their ancestors extremely disturbing. I'm sure that Webb, like the Sons of Confederate Veterans, would respond that everyone has a right to take pride in their own heritage. Well, it isn't so simple. When the past of a certain group is so directly connected to the subjugation of others -- and, let's recall, we are barely more than a single generation removed from the time when institutionalized racism was the law of the land in the American South -- then the celebration of that past is, at minimum, a complicated matter. The Sons of Confederate Veterans would have you believe that the celebration of Confederate heritage is the same thing as Black History Month. But it's not even close. Perhaps the most unappealing thing about Webb's worldview is that it seems to be built largely on resentment. In his book Born Fighting, you can practically feel the resentment coming off the page when he writes, "The slurs stick to me ... Rednecks. Trailer-park trash. Racists. Cannon fodder. My ancestors. My people. Me." To disaggregate these resentments: There is Webb's resentment of elites, whom, as Eve notes, he derides as "people of books and pep clubs and prom committees." (People of books--what an ugly phrase, especially given that Webb himself is a writer. Haven't we had enough of the anti-intellectualism of George W. Bush and others who insist that there is virtue in ignorance?) There are also his resentments that focus on gender and ethnicity. Why is this troubling? Because worldviews built on resentment are almost always bad news. They are often bad news even when those resentments are deployed on behalf of a minority group with justifiable historical grievances. (See Jeremiah Wright and Louis Farrakhan.) But they are really bad news when deployed by a historically dominant group (men, southern whites) that feels its traditional dominance slipping away. Indeed, it is just this sort of resentment that has spawned some of the least liberal developments in American history -- from Jim Crow laws to periodic outbursts of anti-immigration sentiment. All of this information about Webb is out there and relatively well known. Which makes the Democratic infatuation with him all the more perplexing. Why are so many liberals willing to overlook so much evidence suggesting that Jim Webb sees the world so differently than we do? Part of the explanation is obviously that liberals want to win so badly that they are willing to overlook flaws in any running mate who might help Obama garner votes. But there has to be more to it than that, since the flaws that liberals are overlooking in Webb's case are not an isolated heresy here or there, or even (as with Sam Nunn) a marked tendency towards centrism, but rather a considerable body of evidence suggesting that his general outlook is deeply estranged from our own. Besides, it's not like liberals are merely saying they would tolerate Webb in order to win back the White House; a lot of them (like Katrina vanden Huevel) seem genuinely taken with the guy. What gives? The answer, I think, lies in the difference between politics and philosophy. Liberals are looking only at Webb's positions, not his worldview. In the years since he left the Republican Party, Webb has found his way to certain policy stands that liberals correctly find attractive. He was right about Iraq, and, on economics, he is right to criticize the disparity between rich and poor. But taking positions that happen to intersect with the views of liberals is not the same thing as actually being a liberal. In a president or vice president, I don't just want someone who agrees with me on some issues. I want someone whose instincts about the world I trust -- whose underlying philosophy is decent, humane, and, yes, liberal. For any Democrat who believes that Jim Webb meets these criteria, I have a simple question: Are you completely out of your mind?